$85.00 Wehrmacht Map of the area around the city of Starobilsk in the Ukraine. "Fliegerausgabe" for Luftwaffe Personnel. $125.00 German Map of "Newell" including Witebsk, near Smolensk, in excellent condition. $280.00 Original, watercolor of Kriegsmarine Type IX U-Boat, dated 1940. $335.00 10" x 8" Adolf Hitler wall hanger plaque, in metal on oak. $175.00 Destroy Bolshevism and support the International Crusade Against the Soviets is the message of this German-produced Polish language propaganda "news" poster c 1942-1944 that features references to soldiers from: Holland, Denmark, Norway, Finland, Belgium, Slovakia, Spain, Romania, France, Latvia, Italy, and Hungary. Large 24 ¾" x 37" format. $125.00 "Current Illustrations" a German "news sheet" shows the Wehrmacht on the attack on all fronts circa mid-1942. Large 13 3/8" x 37 1/2" size. Russian language. $290.00 "Tend to the tilled soil diligently!" Happy and contented (former) Soviet farmer sows seeds in (German occupied) Russian farmland. Poster circa 1942. 24 1/4" x 34 1/4". $390.00 "Build Roads! Good roads are the guarantee of the prosperity of the country!" Roadwork - a sign of stability in the German occupied western areas of the Soviet Union. The virtues of reconstruction are heralded in this large 23 ¼" x 33 7/8" propaganda poster. $135.00 Ukrainian language German poster recruits men to volunteer to work in German industry. Excellent example of Nazi propaganda. Circa 1942-1943. 15 3/4" x 32 1/4"
$15.00 'Communism is the real enemy of your motherland! (Publication 506 Gg AN 59): 'Bolsheviks always denied the notion of motherland - now they are using your love for Russia and call on you to take part in Patriotic War. Only by eradicating Bolshevism can you create free Russia. 'German printed, Russian language surrender pass. $15.00 'Stalin's power will not last! (Publication 509 Gg AN 62). "In your midst there are honorable and fair people who can rule [your] country. 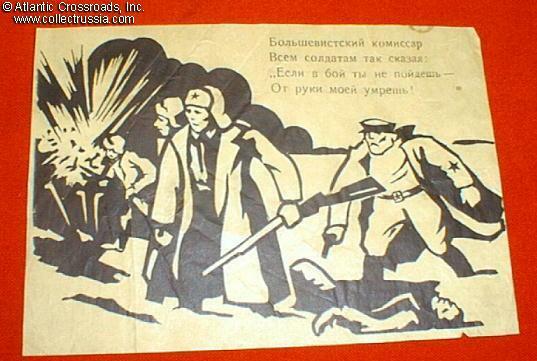 Your place is with us [Germans] and not with Stalin's clique." German printed, Russian language surrender pass. $25.00 Leningrad Front "Surrender Passes", German Printed in the Russian Language, c1942-1943. $15.00 Prisoners of war are well fed! (Publication 649 Gg./111 43). Russian prisoners of war line up like waiters at a four star hotel. German printed, Russian language surrender pass. 6" x 3 3/4". $15.00 'Prisoners of war are enjoying themselves! Contrary to what Red Army officers say - being a prisoner of war is not so bad'. German printed Publication 649 Gg/111 43, Russian language surrender pass. $40.00 'What Germans require from the soviet POW' (publication Sk513). Eight points including personal hygiene, precision and compliance in work assigned. 5 3/4" x 8". Excellent condition. $15.00 Decree #13 of Supreme Command of German Army (Publication AN 128).One page document details privileges granted to defecting Red Army officers and enlisted men. Fair condition. $15.00 General Vlasov (top Soviet defector) tells Russian troops "Russian People are an Integral Part of European Family of Nations! Germans are only against Stalin and are not interested in changing Russia's traditions". It also describes Europe after German victory. 5 5/8" x 8 1/8".